Cladding panels by StonePly make it easy to add the cool beauty of granite, marble, onyx, travertine, and practically any other type of natural stone to elevator interiors, building facades, floors, and more. Panels can be installed using a number of attachment methods. All are relatively straightforward compared to the labor intensive approaches used with heavy stone slabs, which typically involve applying mortar and/or grout. In the concealed screw attachment method, there are numerous metal plates extending from the backs of the natural stone panels. These plates are long enough to enter the joints, and are affixed to the substrate with No. 8 screws. Backer rod and sealant are then used to conceal any screws in the joint areas. The result is a strong, lightweight, shatter-resistant system that has the appearance of thicker and heavier slab stone. 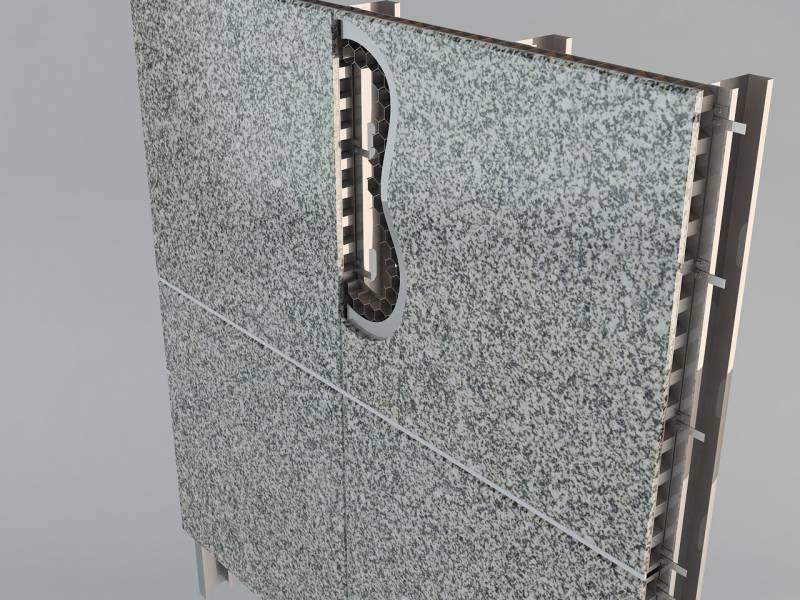 The StonePly website has numerous technical bulletins, CAD details, and specifications explaining the benefits of our cladding systems and how they can help you exceed the expectations of your clients. To make sure all your questions are answered before you make a final decision to work with our team of designers and production professionals, we offer no-charge initial consultations and customized estimates. Get in touch with us any time by calling 903-454-4630 or filling out the form on our contact page.